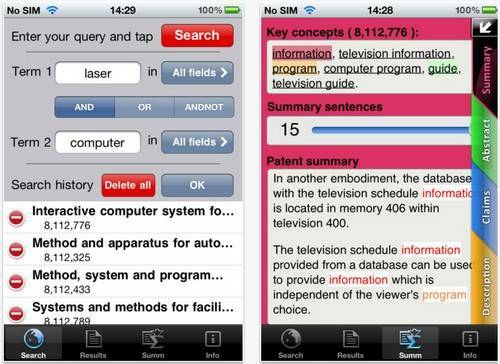 If you are one of the iOS faithful out there and into viewing patents, the is now an iOS application called Patent Summarizer available that is based on a unique semantic engine that is ideal for use by patent attorneys, inventors and engineers, and anyone else who wants a summary of patents and owns an iPhone, iPod Touch or Apple iPad. The Patent Summarizer app for the iPhone, iPod Touch and Apple iPad apparently locates patents by custom query at the USPTO and then delivers a brief summary of the desired patent, analysing a multi page document and represents it to the user in a few sentences. According to PR.com, with the Patent Summarizer app for iOS devices any previously search patent is stored in the summarizer history, features advanced search settings, the ability to adjust the length of the patent summary, navigate between patent sections and highlight main concepts. So for those on the iOS platform that are into patents and would like to take advantage of what the Patent Summarizer app for iOS devices has to offer, you can download the app to your chosen iDevice as a free download from iTunes.